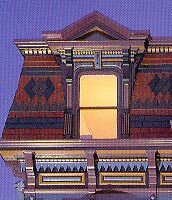 Restoration Project | Rodney G. Karr, Ph.D.
Rodney Karr and his life partner of over 26 years, Bill, owned, resided in, and restored two important landmark mansions in San Francisco. 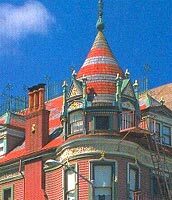 The Chateau Tivoli located at 1057 Steiner Street, at the corner of Golden Gate and Steiner referred to as “The Greatest Painted Lady in the World” (Painted Ladies Revisited), and the city of San Francisco landmark, the Charles Hinkel House and Carriage House located at 280 Divisadero Street. These houses are an integral part of Dr. Rodney Karr’s personal history, and spiritual path. The immense project restoring the Chateau Tivoli occupied Rodney Karr’s mind body and spirit for nearly twelve years. This focus enabled him to survive emotionally physically and spiritually, the AIDS pandemic of death which was taking from him a majority of his friends, colleagues and clients. Rodney sold the Chateau Tivoli in 1996, in order to move on and focus his life and creative energy upon spiritual work and the development of the Five Shaman Circles. The work of Five Shaman Circles, like a stained glass window and the Chateau Tivoli, involves synthesizing and expressing the earth based traditions in a way that can be understood by modern Americans. Rodney also spiritually had to leave San Francisco, and move to a sacred Oak Grove in Walnut Creek, California, in order to be in closer harmony with nature and the Druid tradition. The Chateau Tivoli was sold December 31, 1996. It continues to be operated as a well known bed and breakfast inn. Click here to see the current Tivoli website. The loss of 280 Divisadero Street through foreclosure and the subsequent destruction of Rodney’s Sacred 100 year old Monterey Cyprus tree by its new owners, resulted in Rodney entering a state of “inspired madness”. In Druid and Shamanistic tradition, this spiritual, emotional, physical breakdown, is called inspired madness. It is an opportunity for one experiencing it to toally shift ones life and one’s consciousness. Following this breakdown, Rodney Karr wandered through Golden Gate park for several weeks, and came upon the Nationals AIDS Memorial Grove, and found Monarch Bear Grove. He began going daily to Monarch Bear Grove, and began meditating and praying within the Goddess altar that was there, and a circle of ancient twelfth century stones. He came to the place of making a personal commitment to steward Monarch Bear Grove, and to accept the calling that his inner teacher guide had placed upon him in the form of Jesus years earlier. In this state of inspired madness, Rodney Karr began reading Celtic Mythology and Celtic spirituality. He became aware and connected to the Druid and Celtic Spiritual revival in Britain. Through his readings of books by Catlin Mathews, a member of the OBOD, he made connection to OBOD in Britain, and began a long term study process to become a druid. He has subsequently been initiated first as a bard, then as an ovate (priest), and finally, as a full teaching druid, of the OBOD. He also began deep spiritual work and initiation with the well known celtic spiritual teacher, R.J. Stewart, over the last 10 years. He is an initiated priest in R.J. Stewart’s inner temple tradition (Underworld Tradition).